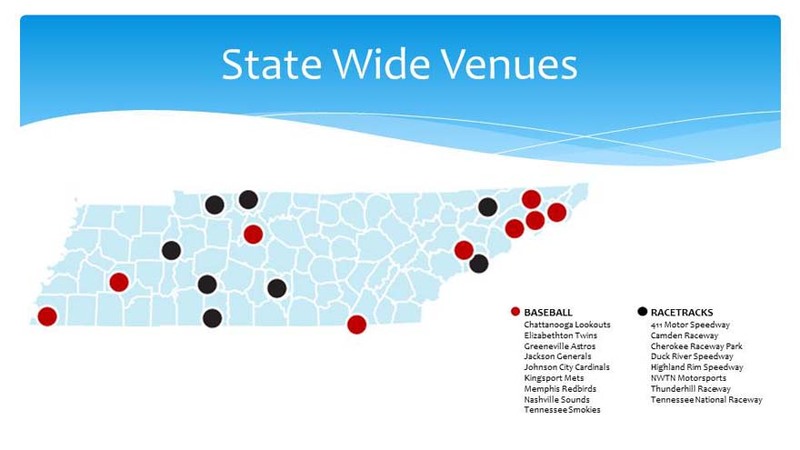 With these clients, Alliance Sport Marketing coordinated campaigns among 9 minor league baseball teams and 8 motorsports venues in Tennessee. These venues reached communities across the state, both urban and rural markets. 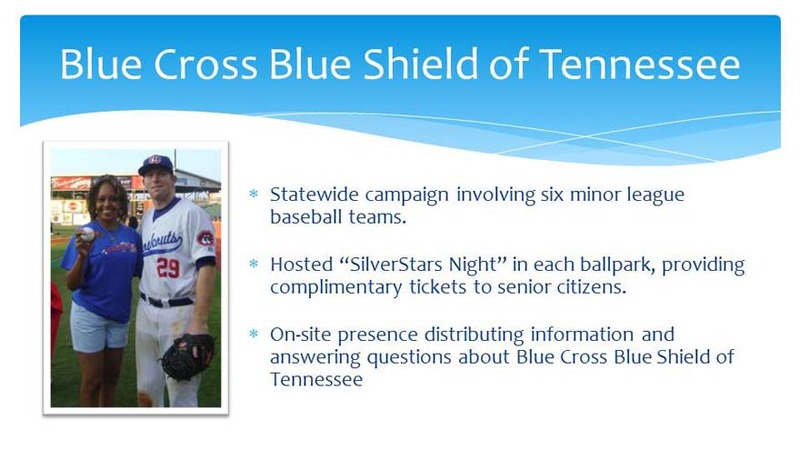 Blue Cross Blue Shield of Tennessee worked with minor league baseball teams, with an interest in reaching senior citizens through America's pastime. 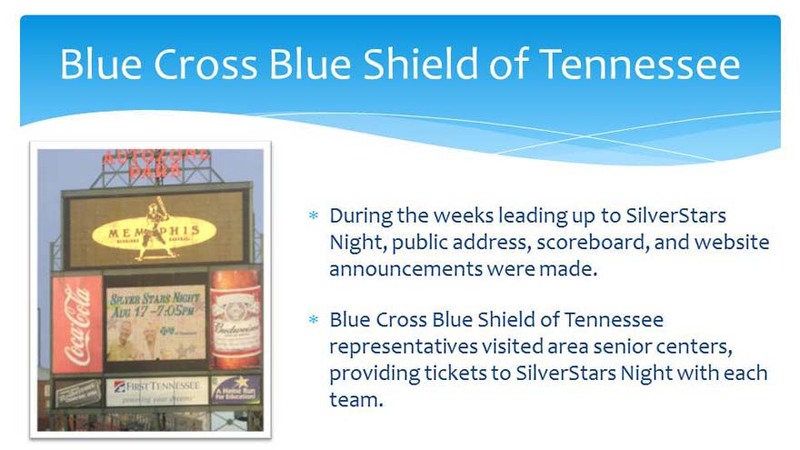 With their SilverStars program, Blue Cross Blue Shield of Tennessee used their partnership with these six teams to host seniors at the ballpark on specific nights, providing seniors with tickets, food and drinks, and other goodies. During the weeks leading up to SilverStars Night, each venue promoted the event through video scoreboard, public address, and website announcements. Blue Cross Blue Shield of Tennessee representatives were provided tickets to the game, and visited area senior citizen centers, distributing the tickets. Chance to interact with fans both prior to and during the game. Blue Cross Blue Shield of Tennessee booth was the central point for distributing tickets, answering questions, and providing promotional items. Blue Cross Blue Shield of Tennessee employees roamed the stands passing out vouchers and talking with seniors about their insurance needs and answering questions. The company mascot was visible throughout the event, signing autographs and taking pictures with fans. One senior was recognized on the field and threw out the ceremonial first pitch. 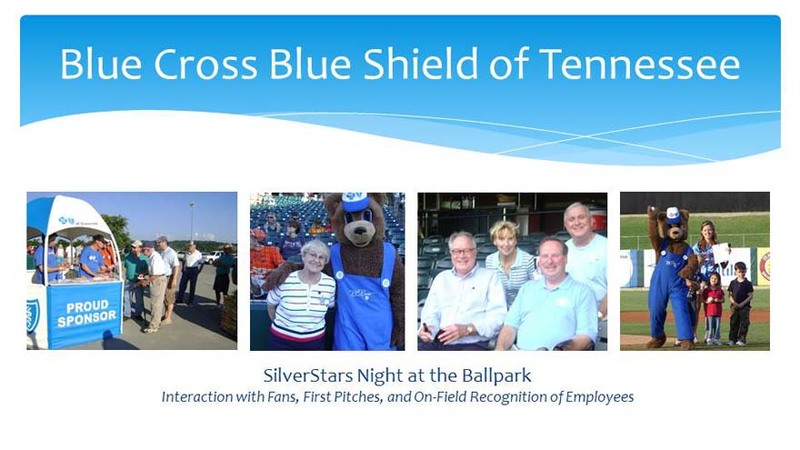 Prior to the game, on-field recognition of Blue Cross Blue Shield of Tennessee employees were provided. Public Address, Scoreboard, and Radio recognition as the game's sponsor. 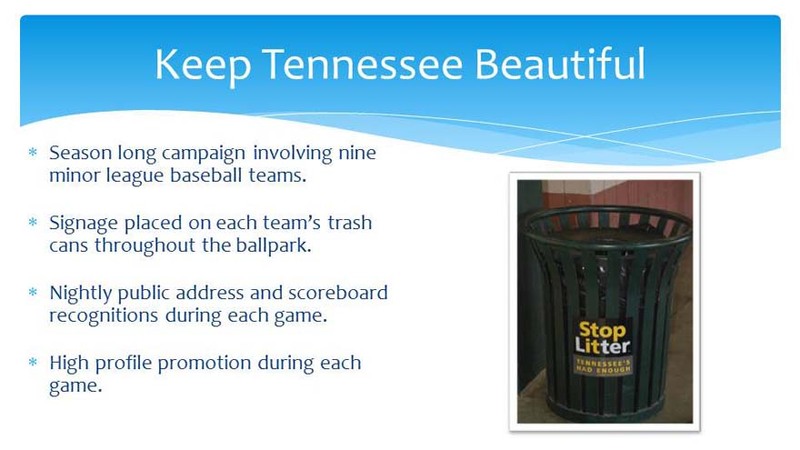 Keep Tennessee Beautiful partnered with nine minor league baseball teams in Tennessee to increase awareness of littering, and provide additional exposure for their Stop Litter campaign. 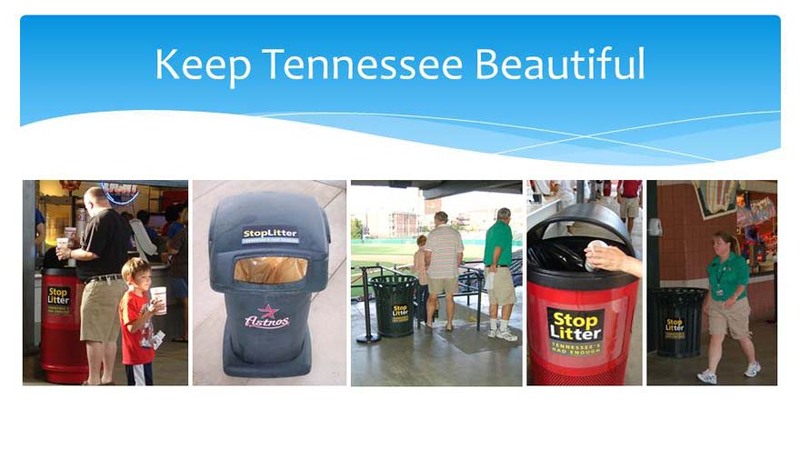 In each ballpark, trashcans were branded with the Stop Litter message. Trashcans were located throughout the ballpark in high traffic locations, providing exposure throughout each event. 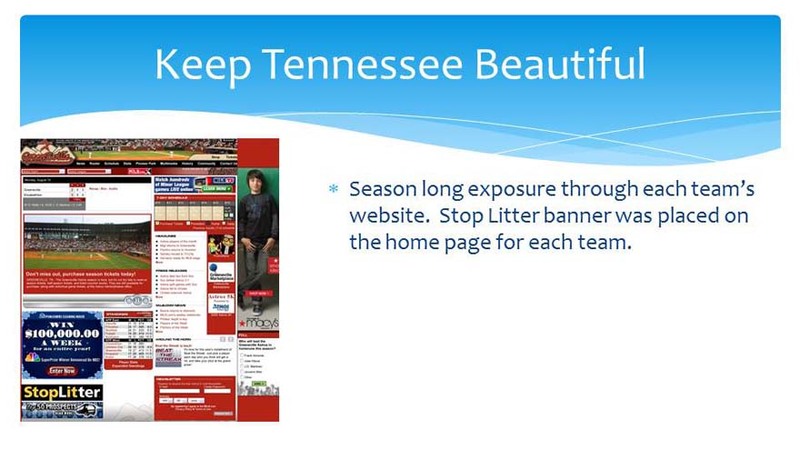 Keep Tennessee Beautiful received season long exposure through a website banner advertisement on each team's homepage. Websites are the best resource for fans to find information on the team, including schedule, stats, news, and upcoming promotions. A fun and memorable promotion was held each game. 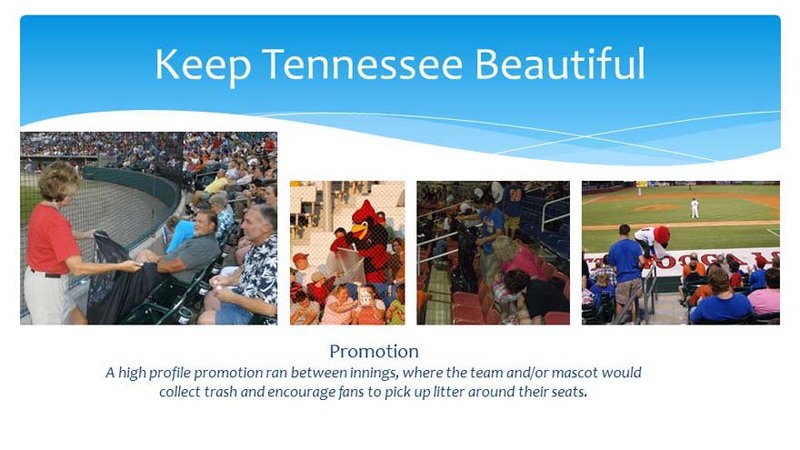 Between innings, ushers and team mascot would encourage fans to look around their seats, and help pick up litter, and place them in the proper receptacles. This promotion brought awareness to fans' surroundings, noticing that their area had become littered with trash, and how simple it is to pick it up and place it in the trash. Knowing that NASCAR fans are 28% more likely to smoke than other adults, C.H.A.R.T. 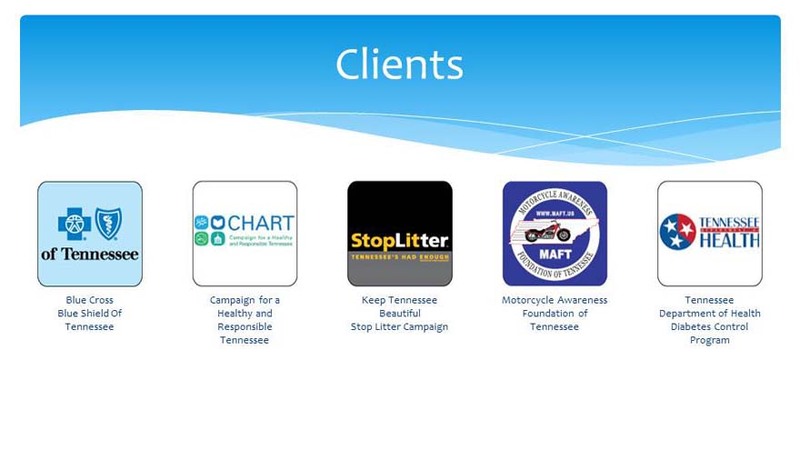 utilized motorsports venues in Tennessee to promote the Tennessee Quit Line, an effort to support smokers to quit smoking. 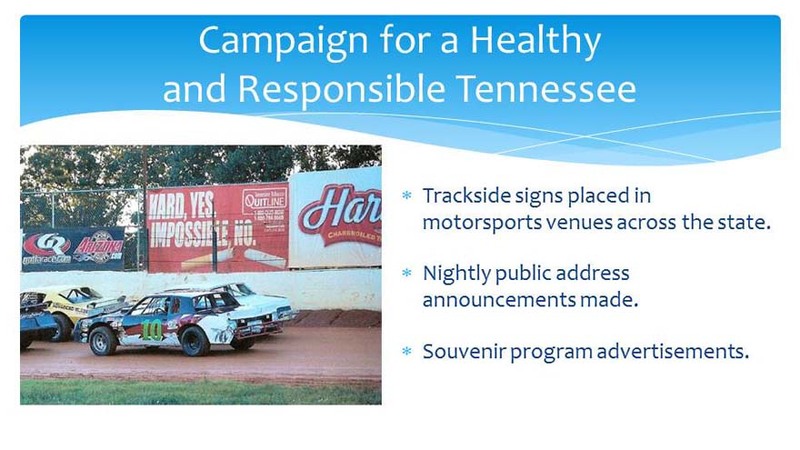 Trackside signs were placed within these motorsports venues, providing exposure throughout each race, often lasting 3-4 hours. M.A.F.T. 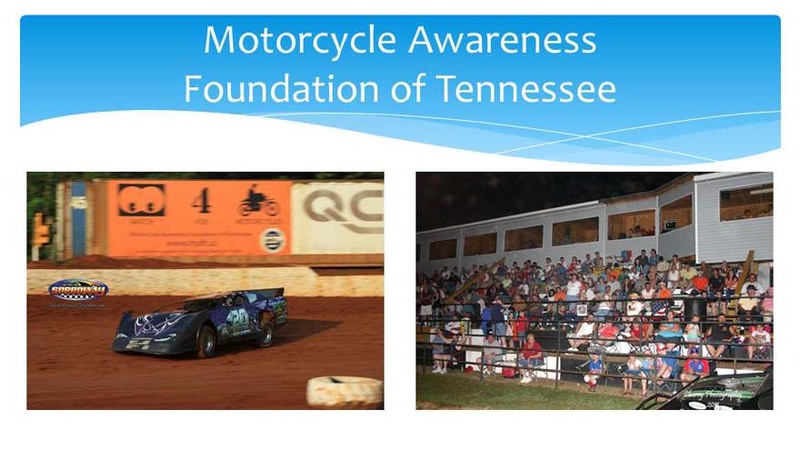 utilized motorsports venues to increase awareness of Motorcycle Safety. Through signs and public address announcement at each venue, M.A.F.T. 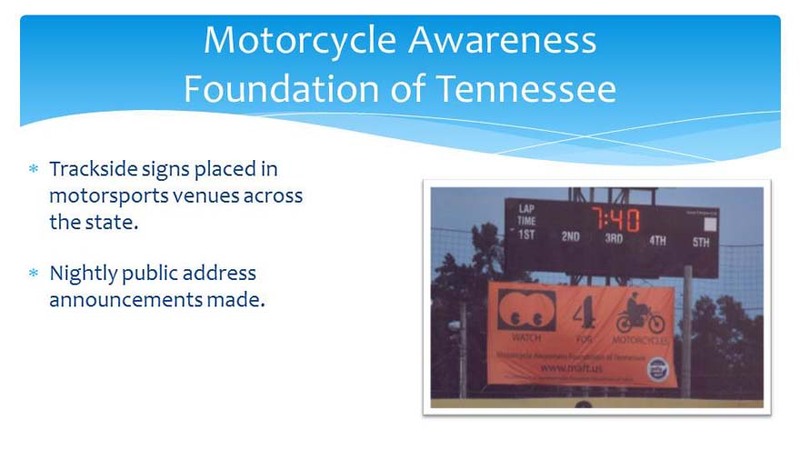 reminded fans to Watch for Motorcycles when on the open road. 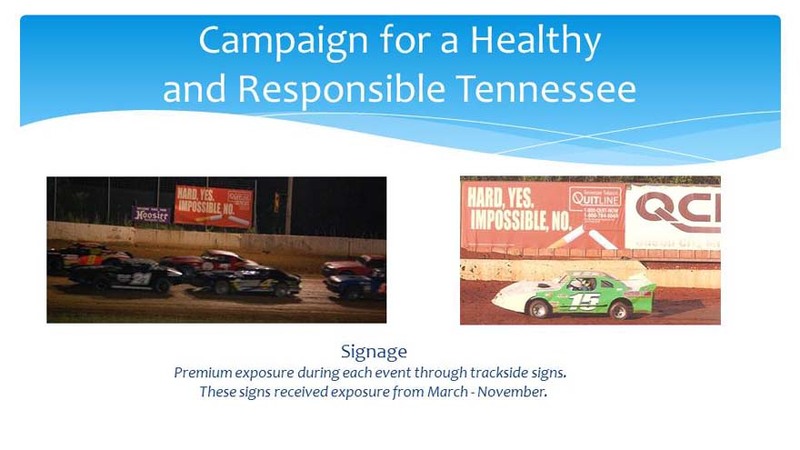 Signs placed in each motorsports venue were trackside, providing consistent exposure throughout the event. Nightly public address announcements were also made, grabbing the attention of fans in attendance. 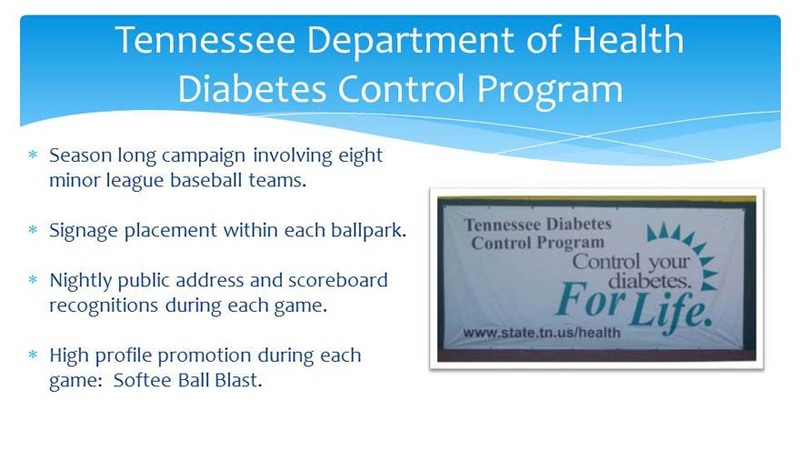 The Tennessee Diabetes Control Program was designed to raise awareness of lifestyle changes as they relate to diabetes. Undestanding that obesity, diet, and exercise are factors in diabetes, the program's goal was to educate communities and encourage behavior change to avoid diabetes complications. 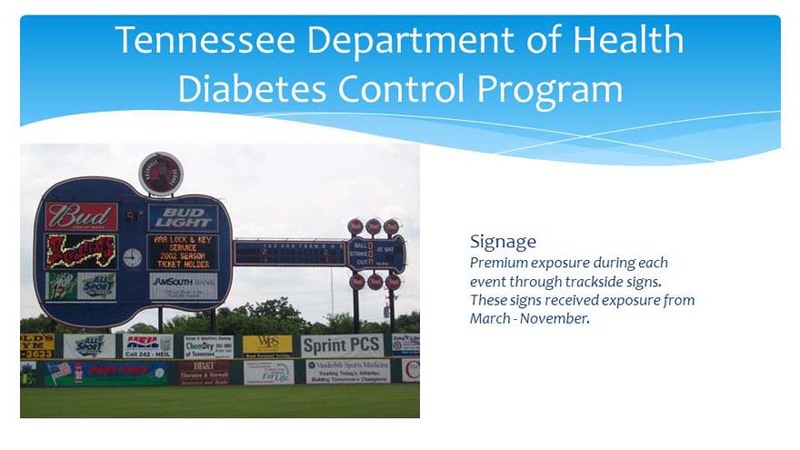 Signs were placed in each ballpark, carrying the Control Your Diabetes For Life saying and website for more information. 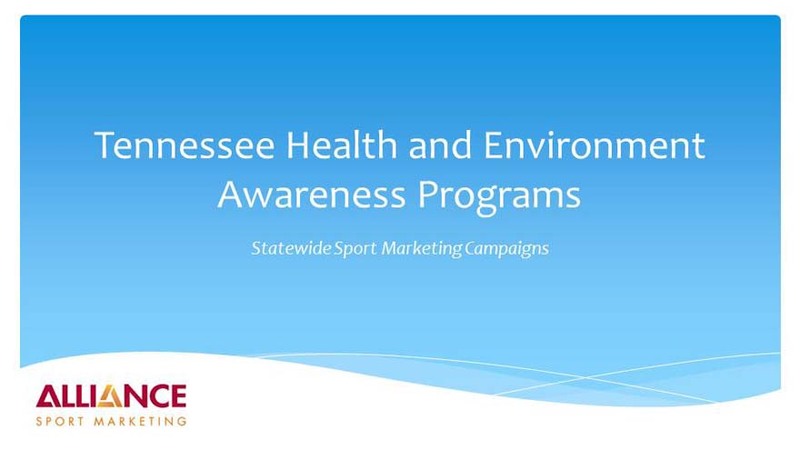 In addition, nightly public address announcements, including facts on diabetes and examples of suggested lifestyle changes were made to fans during each game. Each night, soft baseballs were "randomly distributed" to fans in attendance. 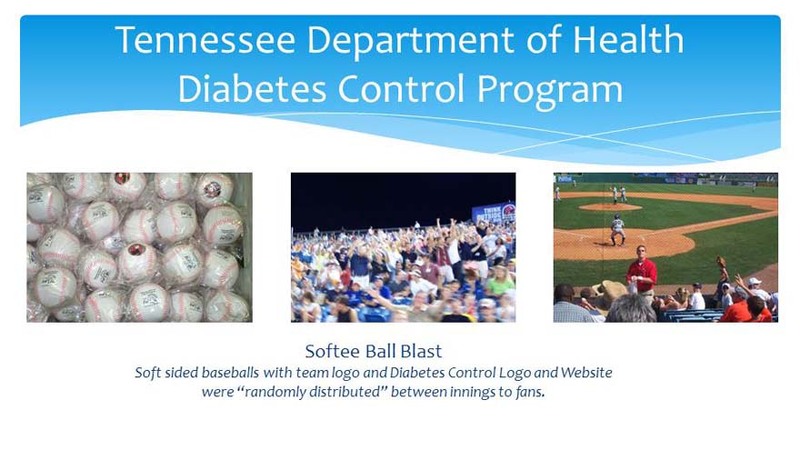 Each softee ball carried the team logo and Control Your Diabetes For Life message. This promotion quickly became a fan favorite, and provided immediate, eye catching exposure to the program.